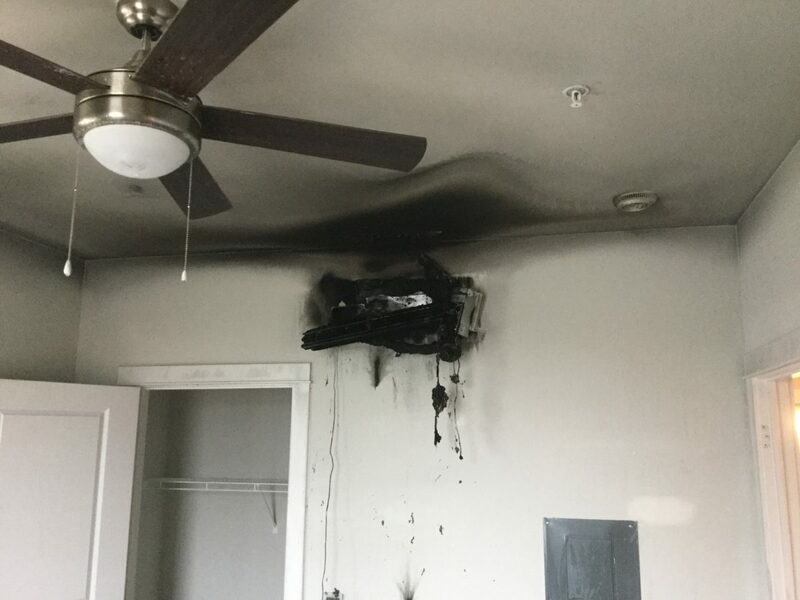 A single sprinkler head prevented what could have been a catastrophic fire at the new Pure Apartments in the 4100 block of Pure Street in St. Peters, Missouri, which is still under construction. The fire started in a faulty heating and air conditioning unit and was discovered by construction crews at around 9:30 a.m. on Saturday, March 30. This is the second fire at the complex in the past five months. Central County Fire & Rescue (CCFR) crews arrived on the scene and discovered heavy smoke on the first floor. Upon further investigation they found a wall mounted heating and cooling unit that had caught fire and was extinguished by a single sprinkler head, preventing the fire from extending past the room of origin. Fire crews quickly shut down the flowing sprinkler head, checked for further hazards and returned the suppression system back to service before leaving. The estimated damage is approximately $3,000 with a value of the building estimated at $1,300,000. Repairs to the building will include replacement of the wall mounted HVAC unit, paint and water cleanup. No other portions of the building or complex were damaged or impacted. The building is in the final stages of construction and no occupants were present at the time of the fire. In November, construction workers using a flammable adhesive ignited a fire while using a metal angle grinder in the 2100 building of the complex. The sprinkler system kept the damage to less than $5,000. Both buildings are three-story wood structures. The CCFR Prevention Bureau requires that adequate access and fire protection systems be in place and in service as soon as possible during the construction process to prevent a major incident. “In each case, without the sprinkler-based fire suppression system being active the fires would have escalated very quickly and both buildings would have been a total loss,” says CCFR Assistant Chief Steve Brown. CCFR was assisted by the St. Charles County Ambulance District and the City of St. Charles Fire Department on the call.